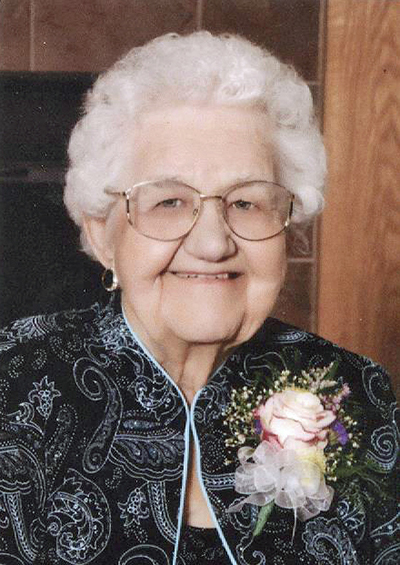 Anna C. Herickhoff, age 106, of Elrosa passed away Thursday, Feb. 16, 2017 at Pine Villa Care Center in Melrose with her family at her side. A Mass of Christian Burial will be celebrated at 11 a.m. Saturday, Feb. 25, 2017 at Saints Peter and Paul Catholic Church in Elrosa with the Rt. Rev. John Klassen presiding with Father Peter Kirchner and Father Ken Thielman concelebrating. Interment will be in the parish cemetery. Visitation will be from 4 to 8 p.m. Friday, Feb. 24 at Patton-Schad Funeral Home in Sauk Centre and from 9 to 11 a.m. Saturday at Saints Peter and Paul Catholic Church in Elrosa. The Rosary and parish prayers will be held at 7:45 p.m. on Friday evening at the funeral home. Anna Caroline was born Nov. 17, 1910 in rural Saint Rosa, the daughter of Bernard “Ben” and Frances (Stoermann) Boecker. On April 8, 1931, Anna was united in marriage to Bernhard “Ben” Herickhoff, a German immigrant. The couple farmed three miles south of Elrosa. Anna was an ardent supporter of her husband’s business, her children, and her community. She always had a positive attitude and a strong faith. Anna was an active member of her church, the Christian Mothers Society, and Daughters of Isabella. Over the years, she entertained many German visitors. She wrote and spoke German her entire life. Anna and Ben retired to Elrosa in 1974. They were married 62 years when Ben died in 1993. After retirement, Anna attended daily mass. She enjoyed traveling, gardening, reading, singing, embroidery and quilting, having hand sewn more than 500 quilts. Anna moved to Parkview Assisted Living in 2003. She moved to Pine Villa Care Center in 2010 at the age of 100. She is survived by her ten children, Lawrence (Marlene) Herickhoff of St. Paul, Irene (Ed) Harren of Freeport, Rita Walz of Belgrade, Dr. Robert (Pam) Herickhoff of Mankato, Charles Herickhoff of Crystal, James (Ruth) Herickhoff of Fort Collins, CO, Norma (Joe) Moening of Sauk Centre, Marie (Ken) Bezdicek of Arden Hills, Mark (Donna) Herickhoff of Elrosa, Bernie (Linda) Herickhoff of Villard; nephew, Henry (Vickie) Herickhoff of Sauk Centre; 41 grandchildren; 102 great-grandchildren; and 32 great-great-grandchildren. Anna was preceded in death by her husband, Ben; son, Harold Herickhoff; son-in-law, Harold Walz; four grandchildren; her parents, Ben, and Frances Boecker; brothers and sisters, Agnes Beste, Marie Robideaux, Theresa Tschida, Valeria Funk, Paul Boecker, Lawrence Boecker, and Norbert Boecker. Casket bearers include Anna's sons, Lawrence, Robert, Charles, James, Mark, and Bernie Herickhoff. Words of Remembrance will be shared by Marie Bezdicek. Lectors include Mark Herickhoff, and Robert Herickhoff. Petitions will be led by Norma Moening. Abigail Rose Herickhoff will sing a solo during the mass. James Herickhoff, Charles Herickhoff, and Lawrence Herickhoff will carry the communion gifts and Dacia Herickhoff and Jordan Herickhoff will be mass servers.